Got a question or want to know more? Ask us now! Learn to surf in one of our specifically designed beginner surf lessons. These are structured to get you up and riding the waves regardless of your experience level. Our professional team of instructors will assist you in the fundamentals of surfing. From beach awareness, surfing etiquette, surf safety, wave selection, catching a wave, getting you to your feet and riding the waves. We guarantee your satisfaction with every lesson. We pride ourselves on making the process of learning to surf fun and easy. Your every need will be catered for as we can adapt quickly to work with your strengths. We constantly monitor our beaches to make sure you get the best possible waves. Our group surf lessons are designed to help you no matter what your level is already. From the complete novice and those who have already had a few lessons we will develop your skills further. For the advancing surfer we may need to make a few adjustments to which lesson you join but be prepared to be pushed towards your goals. 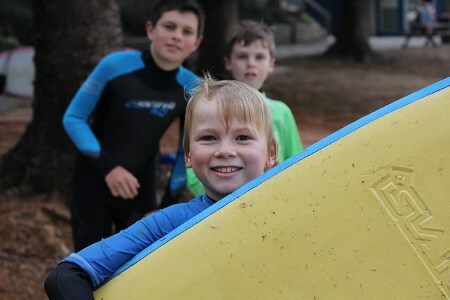 For the novice we help you through all the very basic skills of safety, holding your board, dealing with waves, paddling, catching waves and of course standing up. Once you have mastered these skills our coaches will continue to guide your skills towards, trimming/turning and catching unbroken waves. For the more advancing surfer we can work on such skills as wave selection, reading water movement, using rips, generating speed on the wave, carving turns, duckdiving and more. All equipment is supplied so just bring your swimmers and a towel. Available 7 days a week, on one of Port Macquarie's local beaches. Just hit the booking button and let us know what day suits you or if you know what you want... just buy it. Our popular two-hour beginner surf lesson will get you safely up and riding before you know it. Designed for anyone wanting to give surfing a go. Your lesson will be in a small group with lots of useful and practical tips on surf safety, waves and surfing technique. Suits absolute beginners or those needing a refresher course. Our popular two-hour beginner surf lesson will get you safely up and riding before you know it. Designed for anyone wanting to give surfing a go. Your lesson will be in a small group with lots useful and practical tips on surf safety, waves and surfing technique. You will need 5 consecutive days to complete this course. If you really want to learn quickly then this is for you. This beginners course will start with the raw basics and then build your skills as quickly as you are able to learn. Surf safety, wave types, rips and currents, holding your board, paddling, catching waves, the ‘pop up’, turning, trimming, weight shifting and green waves. Its all covered when you are ready. You will need 5 -10 days to complete this course. If you really want to learn quickly then this is for you. Surfboard, wetsuit, rashshirt, sunscreen, transport and loads of fun. These surf lessons are designed just for you. One on one, we work out your strengths and build on them and help you fix your weaknesses. We pride ourselves on making the process of learning as much fun as possible. To be able to share the Soul Surfing experience with you will hopefully fill your soul with joy for many years to come. For those seeking that personal attention or those needing a particular time of the day. Ideal for shift workers. All private lessons are structured differently depending on the student. For beginners we provide all you need to get surfing fast. For those at different stages of the learning curve we will adjust the learning accordingly. There is no better way to give your kids the knowledge, strength and experience they need to live and stay safe around our beaches. Its a skill you and they will have forever. 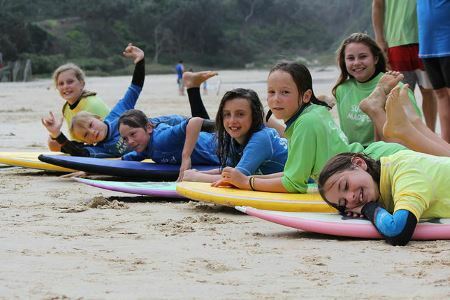 The added bonus of developing surf skills consistently will leave your kids wanting more each school term. Operating Monday – Friday (choose one day) each week of the school year. Your kids are picked up from school in our surf bus, given afternoon tea and we surf until 5:30pm (except winter we finish a little earlier). We use all different beaches depending on conditions and teach ocean safety as well as surf skills. A perfect addition to those doing nippers or an essential program for those who are not. Please read the program policy here. Kids aged from 5yrs up who want to surf regularly. 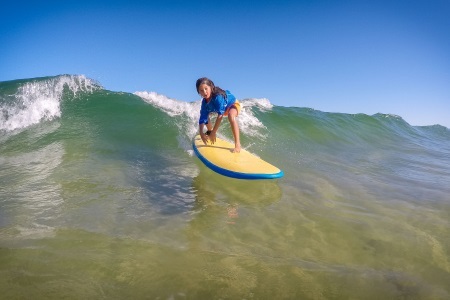 Kids aged from 5yrs up who want to surf and have fun after school. Surfing and being in nature helps to burn your energy and sleep better. There's also a very calming and cleansing effect for most personalities in the period after surfing. School pick up, afternoon tea, surfboard, wetsuit, rashshirt, sunscreen and loads of fun. If you are not sure you want to commit to a full 10 week program then start with just 5. If your child wants to continue you just pay the balance for the full term fee. Soul Surfing coaches will adhere to the safety guidelines set out by ASI (Academy of surfing instructors). Each accredited coach is qualified with surf rescue and first aid certificates. Each lesson will be conducted with no more than 6 students / coach. Only in very rare circumstances (no other coach available and extremely safe surf conditions) will we utilise our limit of 8 students / coach. The after school program will be scheduled to run every day that it is programed. This means that even if the surf conditions are unsuitable we will still run our program but with a change in activity. We will not surf if our coaches in charge deem conditions to be unsafe. This can be for a number of reasons being large powerful surf, shallow waters with difficult conditions and electrical storms. Please note that electrical storms are common in Term 4 but do pass very quickly in most cases and surfing will be possible during the lesson period. Please do not panic about your child’s safety. We will keep them out of harms way. Emergency assembly point will be at the Soul Surfing trailer. There will be a mobile phone available in the trailer at all times for anyone to use in an emergency. Full payments are to be made within the first 3 weeks of term. Payments made after this will incur a $50 late payment fee. Please communicate with us immediately if any problems arise with this. Make up lessons can be made available if adequate notice is given. Please notify us ASAP if your child will be absent on any day. Any notification after 10am on the day will void your make up. Please communicate any changes regarding early pick ups and/or if a friend or relative will do the pick up. Please remain seated with seat belts on when in the bus. Do not change seats during your trip. Please respect the role of the bus driver and keep your voice levels at a moderate volume. Listen and respect all directives given to you by any coach or bus driver. Please remove all of your school gear from the bus when you arrive at the beach. Security of laptops is exempt from this. Every time you need to visit the bathroom or need to go out of sight from your coaches you will need to be assigned a ‘Buddy’. Do not go on your own. You must notify a coach each and every time you plan to leave the sight of your coaches. Suits kids aged 5-14yrs wanting or needing full day of fun or childcare. It’s a full day of fun with surf lessons, beach games and other activities. Surf and beach safety is covered as well as surf skills. Please send your kids with hats, sunscreen, warm clothing, morning tea and lunch. 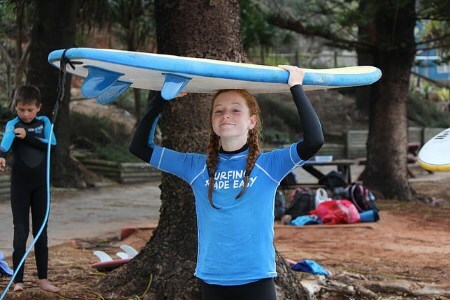 Surf equipment and lesson, extra activity listed below, transport, sunscreen and loads of fun. Choose one day or more. Surf lessons specifically designed for all women keen to give surfing a serious go! These surf lessons designed for women by women will nurture, assist and guide you towards your surfing goals. These may only be simple to start with but we bet you will continue to move the bar higher and further out in front as you surprise yourself with your new skills. And the added bonus of gaining a 'surf sparkle in your eyes' or a 'surf shine in your smile' is the best part! Its not easy to learn to surf but we promise to make it easier than anyone else and you will love every minute of it. All women keen to give surfing a serious go! Length: 10 sessions over 4 months. This 10 week program will aim to unleash your inner child. Come out of your shell and play in the waves! All while learning the thrills, spills and skills learning to surf has to offer. Make friends, be supported and nutured by a mature female coach and her entourage of kind, thoughtful and considerate coaches. An added bonus is the surf specific stretch and yoga postures you will learn to help you get the most out of your surfing experience when needed. This program will aim to unleash your inner child. Come out of your shell and play in the waves! All while learning the thrills, spills and skills learning to surf has to offer. Make friends, be supported and nutured by a mature female coach and her entourage of kind, thoughtful and considerate men. An added bonus is the surf specific stretch and yoga postures you will learn to help you get the most out of your surfing experience when needed. If you have a family and would love the personal attention for you and your special offspring then this private family lesson is for you. Soul Surfing is a family business. My wife, myself and our four kids love to go surfing together its what vitalises us and keeps us connected as a family and to our amazing environment. Our proffessional staff will ensure you have fun while learning to surf, join us for a Surf lesson with Soul. Get your whole family experiencing the pleasures of surfing. How often do you all participate in the same activity, together? Kids or teenagers who want to celebrate their birthday out in the surf with their mates. This 2hr lesson will cover all the basics with ocean safety and simple surf skills and techniques. If some progress faster then we will cater for their abilities while maintaining group safety and fun.